Uncle Chico, how many Fila Standards do you know ? There is a “Paulo Santos Cruz Standard” ? 229. Uncle Chico, how many Fila Standards do you know ? There is a “Paulo Santos Cruz Standard” ? I know four Fila Standards. No, I did not know any “Paulo Santos Cruz Standard”. In 1951 Adolpho Lourenço Rheingantz, then president of the Kennel Club Paulista (KCP), invited our dear Paulo Santos Cruz, Father of Fila, to prepare a Standard for the Fila Breed which until thendid not exist. This Standard was elaborate entirely by Paulo Santos Cruz but, for convenience, it was decided to also add the signature of veterinarian and German Shepherd breeder, Erwin Waldemar Rathsan and also of a traditional Fila breeder. João Ebner was chosen. This Standard was also immediately accepted by BKC, which sent it to be record in 1.952 in the Brazilian Ministry of Agriculture, which approved without restrictions. Only in 1968, thanks to the efforts of Antonio Barone Forzano, this Fila Standard was recognized by the FCI. 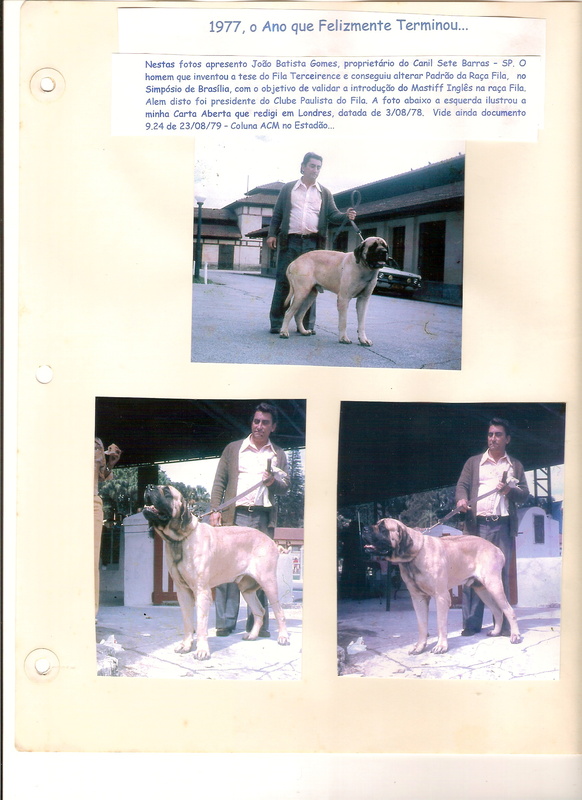 It was the modification of the first BKC Standard above, which occurred in 1.976/77 during the Brasilia Symposium which was organized by João Batista Gomes (former president of the Clube Paulista do Fila and English Mastiff breeder, see in http://www.filabrasileirochicopeltier.com.br/fotos/1843.jpg) and another breeder from Brasilia. Unfortunately BKC through its president, Henrique Pereira de Lucena, adopted such Standard. It was written by the CAFIB founders in 1978, with the direct participation of our Master of Breeding, Dr. Paulo Santos Cruz. 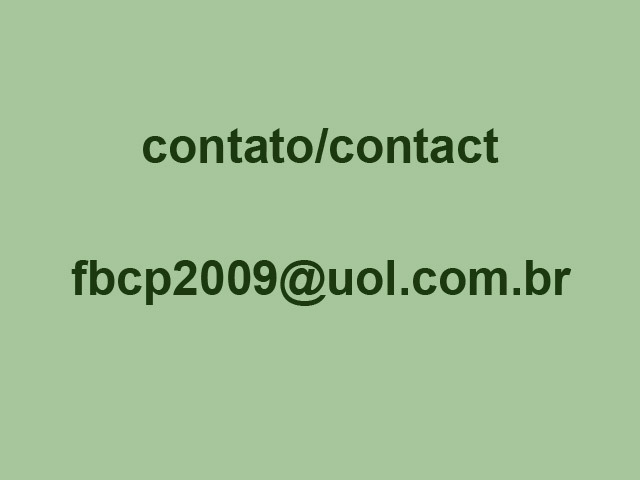 This is a major update with several corrections in the first Standard written by Dr. Paulo himself to KCP / BKC. Therefore, in my opinion and according to these clear arguments, there is no “Paulo Santos Cruz Standard “. There are up to 1.978 initiallyonly the ” BKC Standard dated 1,951“, the “ BKC Standard dated 1.976/77” and ” CAFIB Standard dated 1.978“. Even today, in any location, is written and describes a standard entitled “Paulo Santos Cruz Standard “. The designation “Paulo Santos Cruz Standard” has been used in the recent past wrongly, in good faith or not, by many breeders. Some breeders and researchers are referring to “Paulo Santos Cruz Standard” when they wish to remain in a standard that they actually own and are comfortable to them. Ie, not wanting to submit their breeding to any club. Sometimes these are breeders who consider themselves great skill in the Fila Breed and prefer to follow their own free understanding of phenotype and temperament of their Filas. So, this breeders use to say they breed based on “Paulo Santos Cruz Standard “. That is,ultimately, worth whatthey decide. Moreover some breeders advocates the “Old-Fila” and “Authentic-Fila“, but not accurately describe what this exactly means.Thus, in this way, every breeder creates an “old” and “authentic” image partner in his own head… There are up to a few breeders who claim to be members of CAFIB without in fact being: they are not members, do not take their Filas to our Analyses of Phenotype and Temperament, to our Expos or follow our Rules. So they in fact intend to stay free from a firm commitment to the “CAFIB Standard”.I have already received information about a thesis on DNA prepared correctly but based on “Paulo Santos Cruz Standard“. If memory serves me correctly one of the four clubs that existed in Fila USA before 2008 also stated that they follow “Paulo Santos Cruz Standard”, but never contacted CAFIB or published such a Standard. 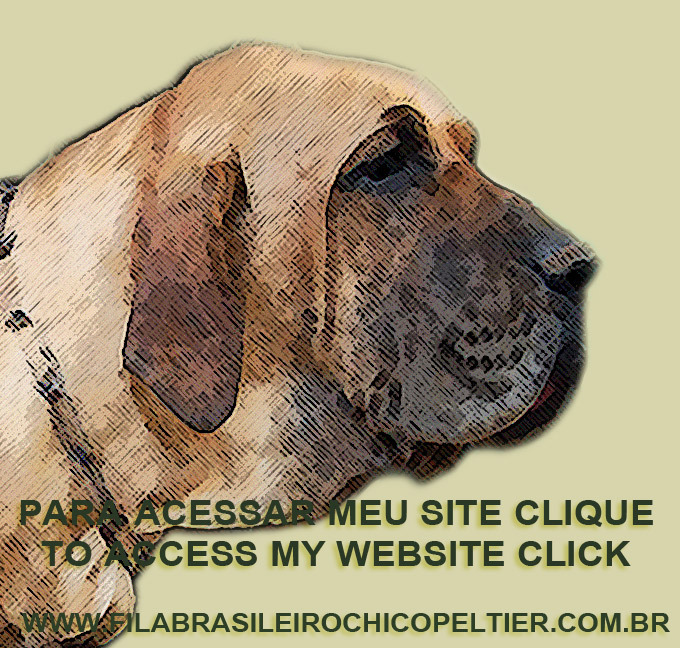 This Standard is applicable in Brazil and can be read inhttp://www.cbkc.org/padroes/pdf/grupo2/filabrasileiro.pdf. Let me explain: the FCI Standard translated into English and Spanish made ​​two “serious faults” and inadmissible, since altered the item Temperament as mentioned by me in English http://filabrasileirochicopeltierblog.com/2013/03/14/post-no-77-uncle-chico-newsletter-29-about-the-temperament-of-fila-brasileiro-ii-the-fila-standard-translated-by-fci-of-belgium-versus-fila-cbkc-standard-sent-mar-14th-2-013/ . Basically, when defining the Fila Temperament, translated “aversion to strangers” to “aloofness towards strangers” into English and “mistrustful with strangers” into Spanish. Ie, as Airton Campbell use to say: an animal that behaves with “aloofness ” and “mistrustful” to strangers, is not a Fila, it must be a cat. But unfortunately, CBKC-FCI Fila breeders never express concern about this serious mistake, since they never asked for correction or at least made its complained. As always they submit themselves docile to CBKC- FCI.